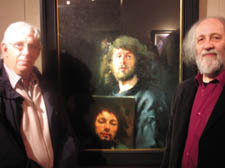 AS I moved among the guests who packed the West End gallery and the tinkling glasses of champagne on Tuesday night for the opening of an exhibition of Robert Lenkiewicz’s paintings, I couldn’t help wondering what he would have made of it all. Robert, who died five years ago, loathed the London art scene. He was that rare artist, perhaps equalled only by Lowry, who flowered in the provinces. But the Halcyon gallery typified the London art scene on Tuesday, as did the prices which ranged from £20,000 to £200,000. Robert, who seemed to spend every working hour painting – he must have finished off hundreds of canvases – died penniless, owing millions of pounds to the Inland Revenue. The tax men, however, had the last word. As executors of his will they have insisted on auctioning off his paintings to cover his tax bill. Robert lived such a full rambunctious life that he made the lives of Van Gogh and Francis Bacon seem as dreary as those of a country verger. He grew up in West Hampstead, appeared to have lost his virginity to his parent’s maid at an early age, and from then on developed one relationship after another – living with 12 women in all, and fathering eleven children. Money didn’t appeal to him. He would give away his last penny. In his will he made out an annuity to a tramp he had befriended. The artist lies in the back garden of his house in Plymouth in a simple grave. Several years ago he was only known to art collectors and the people of Plymouth where he had become a folk hero. Now, his works are being clamoured for, as one of those rare artists who painted the underclass – the handicapped, the tramps, the petty villains and prostitutes. WHAT’S another description for sensational newspapers or tabloids? Red-tops? Gutter-press? An old name came back from the past on Tuesday – the yellow press. It was in use at the end of the 19th century and much of the last century but then it seemed to vanish. But it popped up again when a former senior UN official Klaus Toepfer answered questions after delivering the first memorial lecture in honour of that great Fleet Street figure David Astor who edited the Observer. He had just sat down after lecturing the 300-strong audience at the Royal Society of Arts on the tragedy of the world’s vanishing natural resources when a woman in the 300 strong audience said he was unfortunately talking to the “converted” – he should have been aiming his views at the Daily Mail or the Evening Standard readers. I could see what she meant. The audience encompassed the liberal intelligentsia, all readers of The Observer – and all as green as you can be. But Toepfer remained optimistic. He thought even the ‘yellow press’ were beginning to see the dangers of climate change. No fuddy-duddy, Toepfer came straight to the point. He warned that poor countries object to being lectured on the need to cut down on pollution when the West had built up its lifestyle through wasteful industrialisation. Welcoming the guests, many of whom were old Observer hands, were David Astor’s widow Bridget and their daughter Lucy. David Astor, who died five years ago, was one of those editors after my own heart – never afraid to pursue unpopular causes. When his paper opposed the Suez war, circulation slumped from 800,000 to 600,000 but Astor, a man of principle, wouldn’t give way. He was proved right in the end. Among his many causes was prison reform, and as I left the reception hall I bumped into Terry Waite, the Archbishop of Canterbury’s special envoy who was taken hostage in the Middle East in the 1980s. “David and I were very good friends,” he told me. WHAT do you do if you want to get arrested to make a political point? Nicholas Wood discovered on Monday that it takes several hours and lots of imagination. Wood, anxious to protest against the Iraq war, staged a one-man demonstration in Parliament Square for three hours in breach of a recent law banning any protest within one kilometre of the Commons. Under the gaze of several police officers, who were standing on the opposite pavement outside the Commons, Wood spread 100 copies of an article that appeared in the New Journal last week on the grass. The inflammatory article, showing how sick babies are dying in Iraq for the want of 90p oxygen masks, blew about in the breeze, but the police remained unmoved. Exasperated, Wood, a former architect who lives in Hampstead, decided to make his point in Downing Street. He hung oxygen masks on the railings as well as an excerpt from a book by Clare Short attacking Blair, and finally the police felt his collar. Not a man to give in easily, Wood argued with the police who slowly took down a statement in which he ranged over the causes of the Iraq war and its violation of the UN Charter and the Nuremberg Judgements. At that point the police asked him how to spell Nuremberg, and to speak more slowly. “At the end, the police said I was being cautioned, and then left it that,” Wood told me over the phone. “A lawyer friend said that in effect I had been arrested.” Wood sounded pleased at that. A MESSAGE board on the internet used by doctors tells it as it is. When one doctor described how he had got a job in the United States, hundreds of other doctors keyed in a similar question: How did you do it? So desperate are junior doctors who face unemployment due to the government’s chaotic reforms, that many of them want to jump ship. Others, fortunately, feel they should stay and protest, and a demonstration is being planned for March 17. But there are other signs of a rebellion. A picture in the weekly Hospital Doctor shows a protest by 30 doctors in Scotland against the government’s plans to replace the Trident nuclear submarines. Nine were arrested. In the same edition a senior London surgeon Paul Thorpe demolishes Patricia Hewitt’s reforms and describe her as being “useless”. Years ago doctors kept their heads down. Today, they are beginning to put them above the parapet. There is hope for the NHS yet.